This old phone box was standing on the corner of First and Jefferson, crying out for a bit of attention. A quick whip of string and tin can later we have a play on outmoded technology and the connections we make in our modern lives. My son is a natural in front of the camera, that stance is all his own. The way his left knee bends and head tilts recall his no fuss attitude. As of today, the tin can is no longer hanging there. Given the area the phone box is in, I’m guessing the can was clipped from it’s string for recycling money. 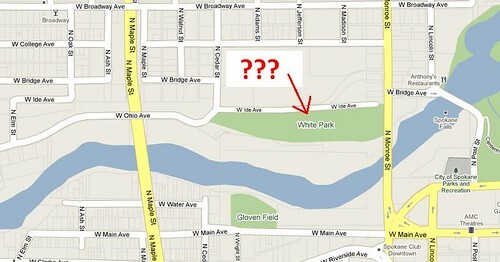 Maybe I’m exposing my own ignorance here, but what on earth is this White Park that shows up in Google maps? Clearly “Gloven Field” is incorrect (it is supposed to be Glover Field) but White Park is news to me. Spanning much of the land that is slated for eventual development by Greenstone, we wonder if the above area would be more appropriately labeled White Parking Lot. I wonder what documents the Google team draws upon when they create these maps? Was there a White Park on the books somewhere back in our City’s history? Not apparently. Searching for White Park Spokane results in a bunch of directions to Aubrey L. White Park up by the Little Spokane. The swanky new parking comes with a price tag to match. At the peak of the Lion King frenzy, the lot appeared to be only 2/3 full at a going rate of $10 per spot. A blurb in the DSP’s Street Talk newsletter pointed me towards the master plan that was written for the Public Facilities District expansion. The new lot features sheltered, automated parking pay stations, new classic style light poles with wrought iron details on Main, 115 new trees, and solar powered lighting. Not bad for a parking lot! While nobody can deny that the new lot is a vast improvement on the asphalt desert that preceded it, I have to wonder if this move effectively delays breaking ground on a planned multi-level structure. The Vision 20/20 plan fails to explain the rationale behind the timing of the current upgrade, stating only that the new lot will be around for about 10 years before Phase Two. Downtown with a portion of current surface parking highlighted. It was painfully ironic how Vision 20/20 carries on about the cultural and authentic place-seeking inclinations of Gen Y (see pages 24-25) only to result in the wrecking ball for one of their favorite local venues. They note a perceived disconnect between the convention center and the emerging East End, and then eliminate the nearest feature of that sought-after urban fabric. In good faith I assume there are solid answers to all of these questions, and the plan suggests several exciting elements that will greatly enhance the downtown landscape if they are pursued. But what should the role of the public be in such a planning process? I was surprised to see that citizens were not listed as stakeholders, and only one public input meeting was cited in the report. The results of that meeting were not outlined, and so after 97 pages it is unclear how the proposal incorporates the perspective of local consumers. We should use the assets we have, such as our visually appealing and unique historic buildings, to invest in permanent businesses and living spaces. 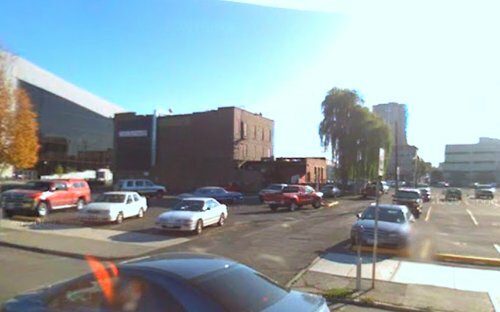 Unnecessary parking lots flatline the heartbeat of downtown, no matter how they are used, and send the wrong message about the vision and direction we want for our city. My friends automatically cringe at the word. Eyes start to roll, people look out the window, and shift around uncomfortably in their chairs. What is so threatening about this word? Sadly it seems in today’s culture of suburban materialism, people have every reason to be suspicious. Especially young people. To our parents, “community” was a tangible thing. Folks grew up knowing their neighbors, etc. Today however, the social fabric of authentic community has all but been ripped to shreds. An average of four hours of television a day, the necessity of two-income households, decreased suburban density and increased total population mean we hardly know the meaning of the word. To certain young people the “C” word represents an obligation they never agreed to fulfill. It is a hollow promise, a loaded word often manipulated by public figures to sell folks on an agenda that may not match up with their own. To some “community” = cloying and claustrophobic. Someone even accused me recently of being in the “Community Cult”. It’s a concept that a lot of people just don’t relate to. Who are the members of this so-called “community” and why is it supposedly so special? When young adults hear the “C” word we tend to place ourselves outside of it. We don’t fit the target audience for the majority of civic dialog as few of us have children, we aren’t in terminal career track jobs, and we’re typically not making mortgage payments or contributing significantly to the tax base. This doesn’t mean that young people are anti-social and lack desire for community of their own. We simply use a different word for the same thing and call it the “scene”. A pet peeve of the Spovangelist is that the concept of “scene” in Spokane is rarely extended beyond the realm of local music. That is a great place for a scene to start, but in more culturally dynamic cities the scene is far more multifaceted than that. What is an ideal scene? Its a large network of people who relate to each others perspectives on jobs, relationships and station in life. They can offer relevant advice on connecting to opportunities that support their shared lifestyle. People in the scene should appreciate the creative work of other people in the scene should it be worthy of such attention. The scene should be able to help its members get hooked up with good roommates, and even share costs on things like throwing parties or transportation to Seattle. The scene should be diverse and interesting. It should provide companionship and expose the people in it to new ideas and ways to recreate. A healthy scene is strong enough to develop its own micro-economy, and this in turn provides meaningful, socially significant jobs to its members. Cheers to the future of the “C” word in Spokane!